This year’s version of the annual developer conference Google I/O is almost four months away but the organizers have already done solid groundwork. It appears the team behind the event has been preparing a teaser for years; that’s how elaborate and complex it is. But don’t worry; the most persistent of Google fans will get a treat at the end of the series of puzzles: the dates for Google I/O 2018 (Read on to find out). It all started with the first clue on Twitter from the official Google Developers handle. The tweet comprises an image, which can be easily deciphered as a binary code. Decoding this spells out the URL for the Google I/O 2018 event page. Once on the site, you are redirected to an interactive Google Maps Street View scene from inside Google’s campus. Walk in and out of rooms and peer through the entire setting of the room to identify clues (marked by the eye icon) around selected objects. I could find these over a Sister Carrie novel by Theodore Dreiser, a serving of sushi, and a calendar which showed August 5, which is marked as World Sister’s Day. Then you head up to a locked door which seeks the answer to the first of four clues. Lacking conviction that Google could possibly delay the I/O event to August, a quick Google search led me to the correlation between the date, the novel, and the sushi, which meant the answer was the sister city of Mountain View or Iwata. Android 9.0 Pineapple Upside-Down Cake? 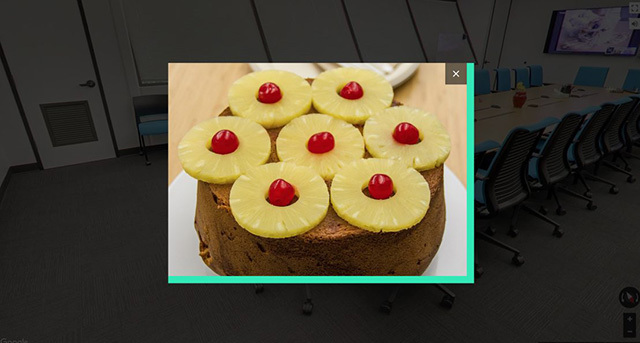 And while I was busy solving the mysteries behind the second door, all I could think of was Android 9.0 Pineapple Upside-Down Cake, because Google teased it as soon as you enter the second room. Although too cheesy a name for Android P, your brain instantly connects links between the OS and any sweet treats around this room. While I was stuck here, trying to crunch the numbers for the second riddle, others had already solved the whole damn puzzle – Did I miss a manual somewhere? 9to5Google’s Justin Duino was one of these geniuses. So there you have it. Google I/O 2018 will be held between May 8 and May 10 at the Shoreline Amphitheatre in Mountain View. Phew! While the mystery is solves, I am not giving up; I want to solve Google’s awesome puzzle completely and I recommend you try doing the same by hitting this link. For now, it may be too wild to make speculations about what will be announced at I/O, but Google’s emphasis on artwork (tipping the hat to the viral Arts & Culture App) in the teaser riddles, the use of many Android P easter eggs (Japan’s famous Pancakes; Pineapple Upside-Down Cake; Purple Yam) point to AI and the next version of Android being the headlining acts this year’s Google I/O Conference.